1. Where in the world were you? I taught in London during spring term 2012. Our classroom was centrally located between Holborn and King's Cross tube stations. 2. What work were you doing there? My appointment was part of the AHA International Program offered through the University of Oregon. Key components of this program include faculty development and international experiences for students. In many of the locations, one American faculty member receives an appointment to teach abroad for one term. I taught two courses: “Fashion and Costume: Past into Present” and “Reinventing Yourself: A Living History of Tudor London.” We scheduled three excursions a week to local sites, relating to course materials. 3. What does this work mean for your students, peers and/or the university? The study of costume encompasses painting, sculpture, decorative arts and architecture, textiles and fashion. The opportunity to go to museums, galleries and special exhibitions enabled the students to see many of the original paintings, garments and stately homes they can only view by PowerPoint in a classroom in Oregon. We were also able to attend acclaimed theatrical performances, tour backstage and see costume collections, exposing the students to some of the best theatre practice in the world. 4. Tell our readers something they should do if they ever visit this locale. One of my favorite places in the world is the Tudor room in the National Portrait Gallery, with paintings of Richard III, Henry VIII, Elizabeth I and their courtiers. The Victoria and Albert Museum is a treasure chest of decorative arts. They stage spectacular fashion exhibits in their Costume Court. Near Holland Park, there are two Victorian homes that are remarkable windows into that era. 18 Stafford Terrace, home of Punch cartoonist Linley Sambourne, still has all the original furnishings, including William Morris wallpaper, and Lord Leighton's House, where the Aesthetic painter lived, which has been restored to reflect how it looked when he was living there. Lastly, a five-pound ticket enables you to be a “groundling” and stand during a performance at Shakespeare's Globe. 5. What was the most memorable experience on your trip? 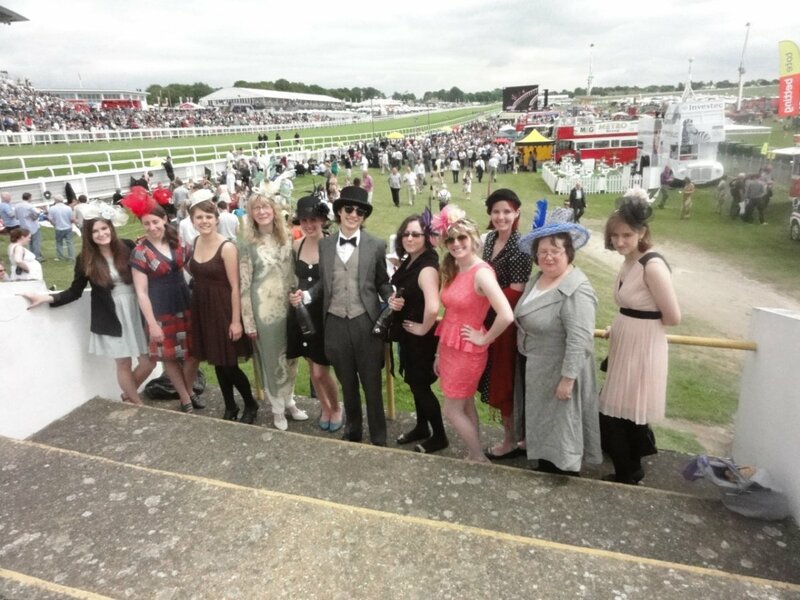 One of the staff members in the London Center suggested we attend Ladies' Day at Epsom Downs Racecourse, a similar event to when Henry Higgins introduced Eliza Doolittle at the Ascot. Since we were studying fashion, one of the course assignments was to make a hat to wear to this event. We went shopping together in London to gather the materials needed for their millinery projects. They all dressed up spectacularly and we made quite an impact when our entourage entered the center of the track for our promenade around the grassy enclosure. UO Abroad is a recurring feature in AroundtheO that spotlights UO professors, staff and GTFs whose work takes them overseas. If you or someone you know is traveling abroad, contact Communications Specialist Matt Cooper at mattc@uoregon.edu.